Are you considering replacing your ring? Ideally, the way you care for your engagement ring would guarantee that it never needs to be replaced; in some cases though replacing your engagement ring may be a necessity. Unfortunately, accidents happen and unexpected circumstances can require you to consider a new ring. Maybe your original ring just doesn't match your style and a replacement ring is something that you desire. Keep in mind that any ring replacement should be done tactfully so that it doesn't hurt the feelings of either the groom-to-be or other family member. The most common reason for replacing your engagement ring is because you simply don't like it. Despite the best intentions when choosing an engagement ring, sometimes a woman's specific tastes and preferences are hard to determine and the proffered ring isn't her style. The original engagement ring may be an antique ring or an heirloom that doesn't match her preferences, or a new style of contemporary ring may have recently appeared that she likes much better. Whatever the reason, the groom should be sensitive to the bride's tastes, and she should acknowledge that if a ring isn't her style, she won't be willing to wear it frequently and that would disappoint the groom. The best course of action is upfront honesty so both parties understand why the ring is being replaced. If the original ring needs to be replaced before it has any significant sentimental value, the couple should simply shop for a new ring together. Considering various diamond shapes, engagement ring settings, metals, and other characteristics will help them select the perfect ring that represents their commitment to one another as well as their individual flair. If the original ring was an heirloom and other family members may be offended by its rejection, it is best to explain the situation to them privately before showing off a new ring. If there is a specific reason for rejecting an older ring - metal allergies, damage, inappropriate balance to a different person's hand, etc. - that reasoning can ease the blow. Asking the family member's input on a new style may also help alleviate bruised feelings, if such a compromise is possible. Occasional accidents happen that may damage an engagement ring beyond repair. Depending on the couple's emotional ties to the ring, either a completely new ring can be purchased or parts of the original ring can be incorporated into a customized new one. For example, the undamaged stones can easily be reset into a new ring, or the metal can be melted down and included in the new alloy. While the new ring will not be identical to the original, some of the sentimental value can be preserved and honored with a new ring. Replace a ring that isn't you. 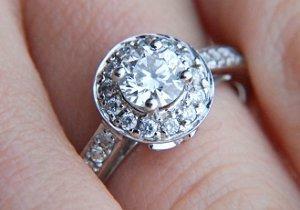 Engagement rings can be lost while traveling, doing housework, or during outdoor activities. Before assuming the ring is lost, search carefully for the item, but once you know it is gone, it is time to consider a replacement. This may be an opportunity to upgrade your engagement ring. If you wish to preserve as much sentimental value as possible, finding an identical replacement may be the best choice. Classic diamond solitaire engagement rings are typically easiest to replace, but a jeweler can usually work with a couple's specifications to recreate any engagement ring. In order to have the new ring match the lost piece as closely as possible, provide the jeweler with any available documentation: jewelry lab certificates and appraisals, lab grading reports, and authenticity certificates can all help the jeweler precisely match the quality and condition of the old ring. Also provide any pictures if possible - many wedding photographers will take several close-up photographs of the couple's rings, both on and off their fingers. The finer stylistic details of a ring can often be recreated with quality images to work from. Before replacing an engagement ring due to loss or damage, always review warranties and insurance policies to see if they will help reimburse all or part of the replacement costs. While not all policies include such coverage, there may be a deductible that can help with the financial burden of a new ring. Certain policies, however, will place cost or style restrictions on a replacement ring, and the couple should always clarify those policies with their insurance adjuster if necessary. No matter what the circumstances, it is possible to replace an engagement ring while preserving stylistic preferences and sentimental value. The most important factor to remember is that an engagement ring is a symbol of the love, fidelity, and honor a couple shares, and those qualities will never need replacing.